Eastern prickly pear doesn't get very tall, but it does tend to spread open and low as it grows. Foliage: Stems are divided into flattened paddle-like segments approx. 2-5 inches long and can have a blue tint. The narrow spines are wedge-shaped and jut out 1/4 inch. Flowers: Flowers of prickly pear are a brilliant yellow and open in mid-summer. They are followed by edible purple or red fruits, called tunas. These are the prickly pears, although not as large and tasty as the prickly pears of O. ficus-indica, they can be made into nice jellies and pickles. Form: The stems will continue to grow into segments, but Eastern prickly pear tends to stay close to the ground. If you've always thought of cactus as being desert plants, it will surprise you to learn that prickly pear is hardy in USDA Zones 2 - 10. Yes, that's Zone 2! How many plants can say that? 6 - 18 inches (h) x 12- 30 inches (w). Eastern prickly pear will grow a bit larger in warmer climates and ideal conditions. As with most cacti, Eastern Prickly Pear does best in full sun, although it can handle partial shade, especially in hotter climates. Expect to see flowers from mid-spring through mid-summer. Use caution when working with any cactus. Even the young, fuzzy looking seedlings can stab. Rose gloves, tweezers and kitchen tongs will come in handy. 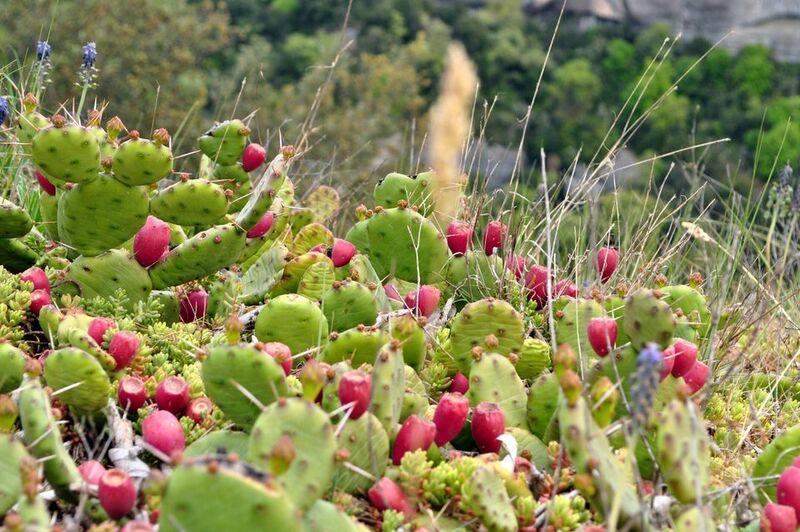 Site: Prickly pears are cactus, and so they need well-draining soil, first and foremost. Plant in full sun in a sandy or gravely mix and go easy on the water. Fertilizer: When planted outdoors in garden soil, no fertilizer is needed. Occasional feeding may be required indoors. Use a well-balanced fertilizer and let the plant tell you when it needs food. If its green color starts to pale or it doesn’t flower, it needs food. Select a ripe red fruit. Slice the fruit open and either sprinkle the seeds in a pot or directly into your garden. Water when the soil feels dry and be patient. Once your prickly pear germinates and starts to grow, treat it like a cutting (see below). Cut off an individual pad. Allow the cut end to dry and heal over, for about 1 week. Plant the pad with the cut end about 2" into the soil. Test for new roots by tugging gently, after about 1 month’s time. If the plant resists pulling, you have roots. If it comes loose, give it more time. Prickly Pear is virtually maintenance free. However, you will need to keep the area weed free, which is no easy task. You may also want to divide or remove plants if you don't want them to spread. Winter Care: Don’t be alarmed if your plants deflate during the winter. This is there normal response to dormancy. They’ll plump back up in spring. Opuntia basilaris - Beavertail Prickly Pear: Velvety pads with a deep purple-red flower. 3' (h) x 24-30" (w). USDA Zones 8 - 10. Opuntia fragilis- Brittle or Fragile Prickly Pear: Slightly smaller than the Eastern prickly pear, with pads that break off and root easily. 6" (h) x 9" (w). USDA Zones 4 - 11. The most common problem is too much water, which will cause the roots to rot and the cactus to collapse. Insect pests: scale and mealybug. Diseases: Leaf spot, black spot, bacterial soft rot, and viruses. Most of these can be avoided with the proper growing conditions.